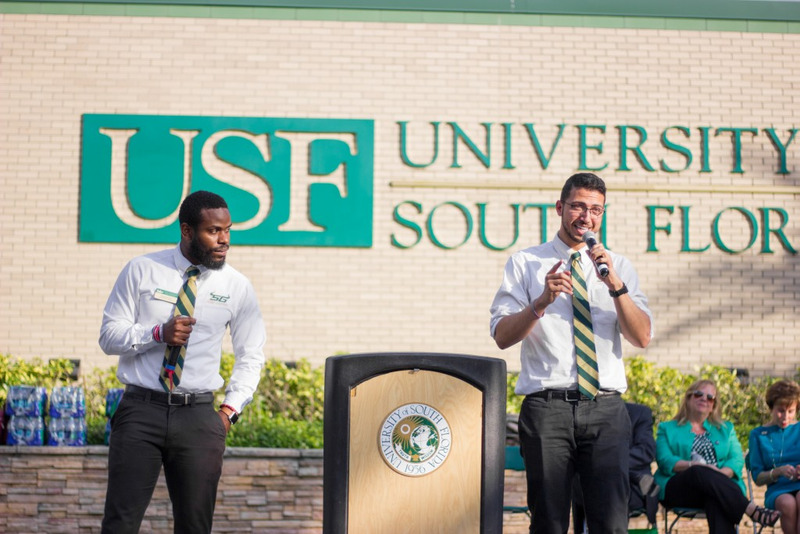 He’s been seen on billboards across the city, on the USF homepage and across campus. On Wednesday, Autar Kaw, who was named one of four U.S. Outstanding Professors of the Year by the Carnegie Foundation for the Advancement of Teaching and Council for Advancement and Support of Education, along with the other three recipients of the award, gathered to share the tools they use to be successful educators and shared their thoughts on the future of higher education at USF’s third annual Student Success Conference. In an age in which technology and information surrounds students, the professors explained how their roles have changed and why they’re still important. Kaw said the key to successful teaching lies in building rapport and connections with students. Students today, he said, require a professor who is accessible 24 hours a day. He calls his classroom a “flipped classroom,” or one in which students watch mini-lectures via YouTube prior to coming to class, when they interact with one another and learn from discussion. Lois Roma-Deeley, one of the award recipients and a professor of creative writing at Paradise Valley Community College in Arizona, said Shakespeare isn’t so hard when he’s understandable. When she teaches Shakespeare’s Sonnet 116, the words become a little more relatable to students, she said. “I tell my students to think of it as two guys sitting in a bar at 2 a.m. talking over a beer,” she said. “You have to make it relevant to the students’ lives, in a very emotional and interactional way as well as relating their imaginations to the course content. Christy Price, and award recipient from Dalton State College, said the modern learner needs information to feel relevant to their lives in order to learn. Keeping variety and pace is important, she said. The educators shared their thoughts on a variety of issues from the role of what textbooks may be in the future to what role online education will play in the need for professors. But though roles have changed, some elements of successful teaching remain the same. Price said the most important thing a professor can do is to let students know that the professor cares about them and their learning process. Kaw said some skills can’t be taught, but can be learned and that the role of professors is important in serving as role models. Todd Pagano, an award recipient from Rochester Institute of Technology’s National Technical Institute for the Deaf, said he realized the value in invested teachers when he was a chemistry student and a professor asked his class to read Henry David Thoreau’s “Walden,” and he began to see interdisciplinary connections in the fields he cared about.